How Do I Make Flowers Last Longer? A little extra care can make any size flower arrangement or fresh flower bouquet last longer. Part of the intrinsic value of fresh cut flowers is the fact that their beauty is so fleeting... it does make them all the more precious. Nonetheless, we usually want those fresh flowers to last as long as possible. Fortunately, we can add several days to the vase life of fresh cut flowers by following the practices used by professional florists to prolong the vitality of their products. A small investment of time will pay off in the extended enjoyment of your beautiful blossoms. Most floral arrangements can be made to last 4-7 days or longer, depending on the flowers used and the care they receive. Keep the vase filled (or floral foam soaked) with water containing a flower food provided by your florist. Flower foods make flowers last longer but it is important to follow the mixing directions on the flower food packet. Fresh cut flowers benefit tremendously from the use of these products, which contain three main ingredients: first, sugar in a form which is useable by the flowers so as to provide nutrition; secondly, an acidifier such as citric acid to lower the pH of the solution (cut flowers take up water best if the pH is around 4.5, well below neutral); third, a biocide to kill any bacteria that may be present. Many of the current generation of fresh flower nutrient solutions also contain an agent which helps keep the water in the vase clear longer. Most packets are to be mixed with either a pint or a quart of warm water. Mix the solution using lukewarm water - 110° F. is ideal. Fresh flowers absorb water faster if it's warm. Flower foods should not be diluted with more water than is specified on the packet. If the flower food solution becomes cloudy, replace it entirely with properly mixed flower food solution. If possible, re-cut stems by removing one to two inches with a sharp knife. Be sure to use a sharp knife or clippers that will not crush the stems. Immediately place the stems into solution. Carefully unwrap your fresh cut flowers and remove any foliage from the stems that would fall below the water line in the vase. The leaves can rot underwater and can harbor bacteria which would decrease the life span of the cut blooms. Cut one to two inches off from the bottoms of the stems, at a steep angle. Use a sharp knife rather than scissors, which can crush the vascular system of the stem and impede the uptake of water and nutrients. If practical, cut the stems under clean water. Re-cutting helps to remove any blockages from the stem, caused by callusing or air embolisms. Once the stems have been freshly cut, immediately place the flowers gently into the vase containing the nutrient solution. Don't drop the stems in - this can bruise the cut ends when they hit the bottom of the vase, again damaging the vascular system. Never pound or crush the stems of cut flowers, even woody branches, for the same reason. flowers in the vase solution you've prepared. Not only are green and flowering plants a great enhancement to any home or office decor, they are also beneficial to your health. The results of a study by the National Aeronautics and Space Administration (NASA) show that common houseplants are powerful, natural air cleaners - all the more reason why you want to keep your plants healthy with the proper care. Plants should not be allowed to dry out or wilt. 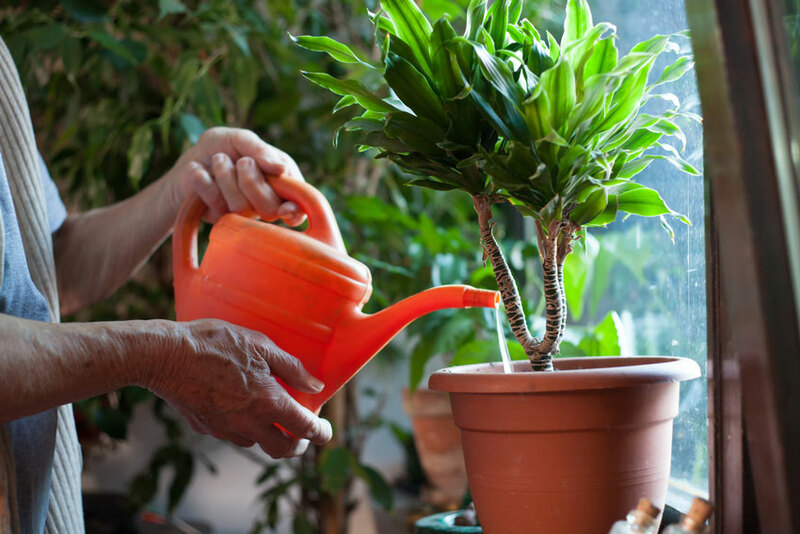 Be careful to avoid over watering - do not allow plants to stand in water. Avoid wetting plant leaves. We hope you enjoyed this article on how to make your plants and flowers last longer.